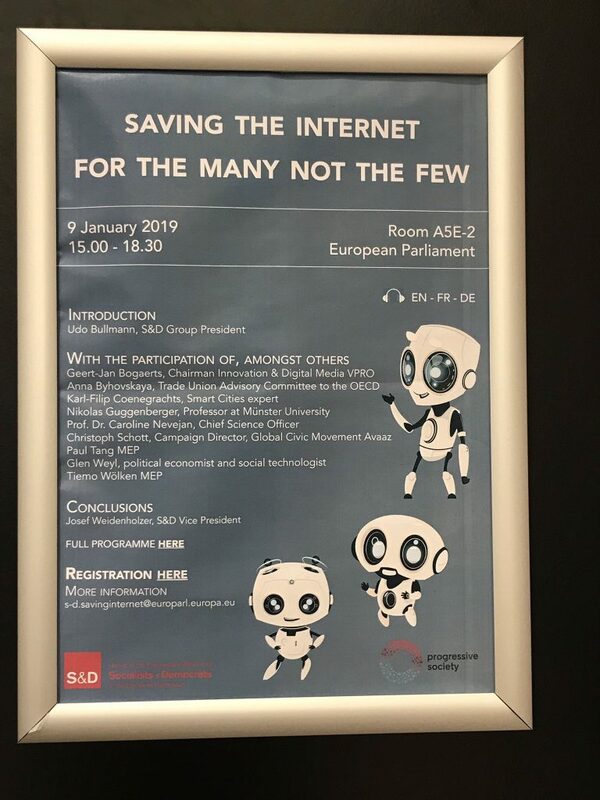 Last week I had the honour of being invited to speak at a conference in the European Parliament in Brussels with the title: “Saving the Internet for the Many not the Few”. This conference was organised by the MEPs of the S&D group in the European Parliament and brought together European experts on different aspects of the topic. In a first panel discussion experts from OECD, Münster University and the Dutch media group VPRO discussed the economic impact of the power of tech giants and the need for the European Union to act in order to put the internet and digitalisation in general back in service of the people. Taxation instruments were discussed next to the impact on labour and future skills. I sat on the second panel that discussed the societal impact of the power of tech giants. Political economist and social technologist Glen Weyl, co-author of Radical Markets, made a case of having data to be treated as labour. In his opinion data suppliers are not rewarded properly for their digital contributions. Awareness amongst users of their value would already make a large difference, as users might form data labor unions to demand fair compensation. Together with Caroline Nevejan, Chief Science Officer of the City of Amsterdam, I was representing the European cities in the debate. As cities are increasingly becoming the standard of human society and city councils are the closest level of government to the citizens, it is only logical that cities and their urban stakeholders have a say in every societal debate. Unfortunately that is not always the case. In most countries it is still a struggle for cities to be heard by their national governments. Fortunately, thanks to the lobbying and the quality of the messages of city networks like EUROCITIES and CEMR and political champions in the EU institutions, the urban voice is well listened to today by both the European Parliament and the European Commission. Caroline emphasized the importance of getting our data back from the corporations. Corporations took advantage of the rapid emergence of data-gathering business models when no regulations were in place. She also made the case that getting the data back is not only important for individual citizens or the European Union as a whole, but also for cities. My starting point was the growing importance of cities and the future cities model that is being used by the EUROCITIES member cities. That model starts from the view that cities are not made for people, but are of people. Data sovereignty and digital sovereignty are of the utmost importance if we want our communities to be empowered and fit for all. Only by decentralising data, technologies and the internet in general once more, will our cities remain places where the people themselves are in control. Projects like Decode and Indienet in cities are leading the way. Let’s hope the European Parliament and the other European institutions will give this topic the attention it deserves in their next political term. The city of the future! What is it? We're discussing it now with our panel experts and chair @woelken! It's the city of the people and not for the people, which improves and empowers communities with a fair use of technologies. Next Post: Smart Cities: Which one do you prefer?